Wall, NJ: Nutrition product manufacturer Global Healing Center, Houston, Texas, recently celebrated the installation of a complete, fully automated bottle filling line at its Phoenix, Arizona facility. Designed and installed by packaging machinery manufacturer Deitz Company, Wall, New Jersey, the new bottle filling line replaces manual desiccant insertion, cotton insertion, capping, labeling, tamper-evident banding, heat sealing and other labor-intensive steps with automated machinery to increase production rates, cut lead times and meet growing consumer demand while also improving consistency and quality assurance in filling and packaging. The new line has more than doubled production from 2,200 bottles per eight-hour shift to 4,800 bottles per eight-hour shift and is ready to accelerate further by adding a second tablet counter/filler when growth demands higher speeds. 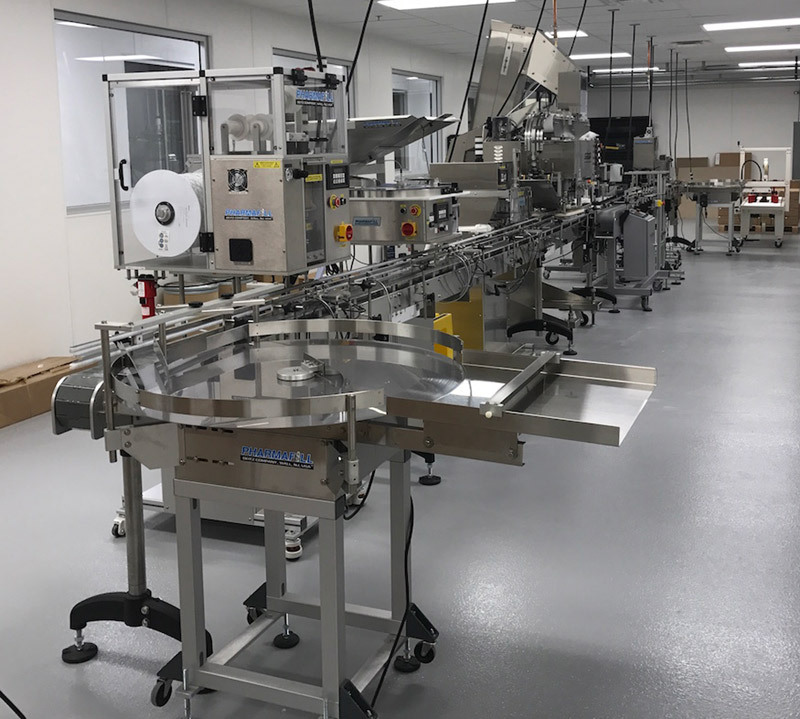 The automated filling line feeds empty bottles from a Pharmafill(TM) brand rotary turntable to a Pharmafill PS1 desiccant pouch inserter, Pharmafill TC3 tablet counter/filler and Pharmafill CS1 cotton inserter. Moving the filled bottles downstream on Pharmafill single lane, sanitary, raised belt conveyors, the bottling line applies caps and labels with a SureKap capper, Autolabe labeler and Pillar induction sealer before entering a Pharmafill BCV1 bottomless conveyor for printing lot codes on the bottle bottoms. Then a Pharmafill NB-1 neck bander applies tamper-evident banding and a Pharmafill HT6B heat tunnel shrinks the banding onto the bottles. The filled and sealed bottles accumulate on a second Pharmafill rotary turntable at the end of the line. “We’ve more than doubled production and lowered our overall labor costs,” says Amado.